I've finally gotten round to uploading some of the photos we got at the cathedral, we literally took hundreds of photos so I've chosen a handful that I love. "Canterbury Cathedral is one of the greatest monuments to Christianity in the UK. The cathedral boasts some of the finest church architecture in the country, built from stone imported from Caen in Normandy. A church and cathedral has stood on the site for over 1,400 years. The first Archbishop of Canterbury was St Augustine who arrived in Kent as a missionary in 597 AD. On his arrival he was given a church in Canterbury by King Ethelbert. Once consecrated Bishop, Augustine established his seat or "cathedra" as the first Archbishop of Canterbury. Between 1070-1077 the cathedral was rebuilt by Archbishop Lanfranc. One of the most famous Archbishops of Canterbury was Thomas Becket who was murdered in his cathedral in 1170." 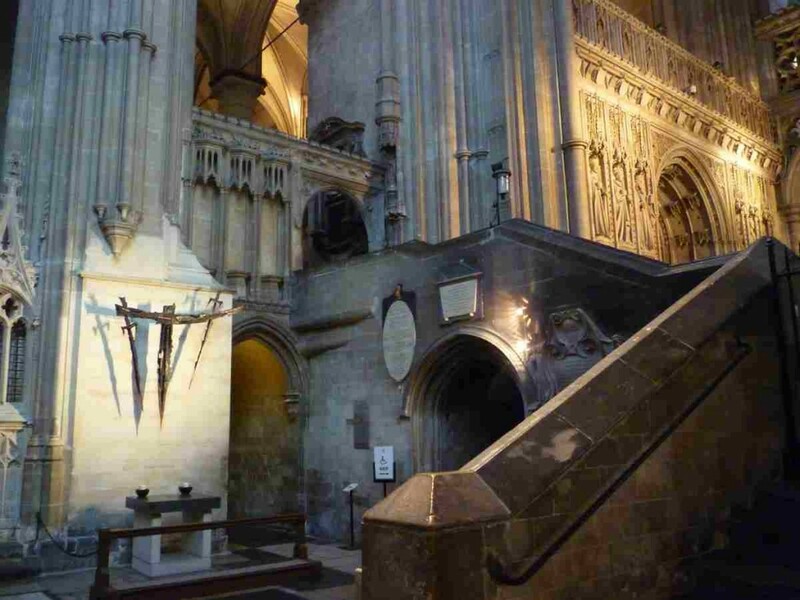 The last 3 photos are taken inside "The Martyrdom", the sculpture on the wall represents the holy cross, the two physical swords represent the two knights that struck Thomas Becket down and the way it is lit shows the shadow of two swords behind, which are the other two knights that came for thomas with swords drawn but did not partake in the killing. The centre of the "crucifix" is a large broken sword point, it is said that Richard Le Breton struck so hard that he broke the end of his sword off, which is why this is known as the Altar of the Sword's Point and is located at what is believed to be the exact site that it all took place. The Cathedral really is an awe inspiring place, and even though we are not christian we would recommend you visit Canterbury Cathedral if you ever have the chance as the place is full os such a rich amount of history and amazing architecture. "...But the third knight inflicted a grave wound on the fallen one; with this blow he shattered the sword on the stone and his crown, which was large, separated from his head so that the blood turned white from the brain yet no less did the brain turn red from the blood; it purpled the appearance of the church with the colours of the lily and the rose, the colours of the Virgin and Mother and the life and death of the confessor and martyr..."